The CMX909B is a half-duplex Gaussian Minimum Shift Keyed (GMSK) BT = 0.3 modem data pump with on-chip packet data handling. GMSK modulation optimises data throughput and packet data handling eases µC processing. The demodulator uses decision feedback equalisation to reduce channel distortion and enhance receiver performance. The CMX909B is backwards compatible with the FX909A and MX909A modem. It offers improved performance, higher data rates and lower voltage operation, as well as handling the recent R14N extension to Mobitex for short block frames. The modem offers 2-strength Xtal driver circuitry –multiple powersave options – for intelligent power management, and is available in 24-pin TSSOP, SSOP (low-height) and PDIP packages. Q. What are the differences between the CMX909B and the FX909A? A. The CMX909B is completely software and hardware backward compatible with the FX909A. The default mode of operation of the CMX909B is identical to the FX909A and the registers, task names, pin names, etc remain unchanged. The CMX909B provides enhanced operation by extending the number of tasks available using Register bits that were reserved on the FX909A and by sharing other bits. The maximum data rate is doubled to 38.4kbps using unassigned combinations of HILON and CKDIV (Control Register b7 – 5). DARA (Control Register b4) and HIBW (Mode Register b0) should be set appropriately. The R14N short block frame has been introduced. See task TSD (Transmit Short Data Block) and RSB (Receive Short Data Block) TASK (Command Register b3..0). Search for Frame Sync and Search for Frame Head with zero errors. See task SFSZ and SFHZ TASK (Command Register b3 . . 0). 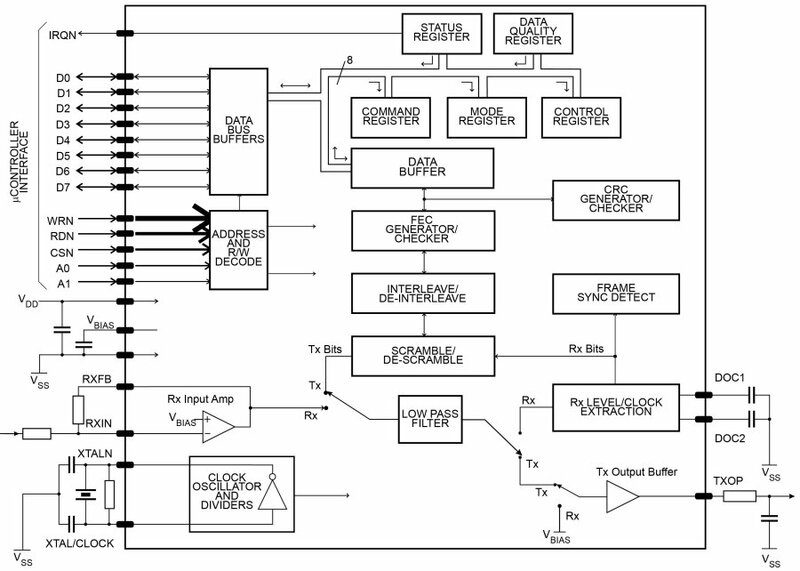 A two-strength crystal oscillator that eases driving different crystal types. High esr crystals, such as low-cost SMC devices, can be driven by enabling HIXTL (Mode Register b1 = 1). A detector that indicates the end of the current packet. The block is activated by setting EOP high (Command Register b5 = 1). The EOP detector status is indicated in the Status Register B0 and can trigger an interrupt. The EOP detector can be used in conjunction with ENV (Command Register b4) when it will interrupt on both edges providing an indication of start and end of packets. A detector that indicates when the received signal envelope exceeds a threshold level. This function is enabled by setting ENV high (Command Register b4 = 1). The ENV detector status is indicated in the Status Register B0 and can trigger an interrupt. This detector can provide detection of the start of a packet when used in conjunction with EOP. Two Enhanced Powersave Modes which give the option to turn off VBIAS only or turn off VBIAS and the Crystal Oscillator block. Leaving the oscillator running does consume more current but allows the CMX909B to come out of powersave within a few microseconds. Operating voltage reduced to 3.0V across the full temperature range. Please note the CML disclaimer notice for applications and FAQ information.